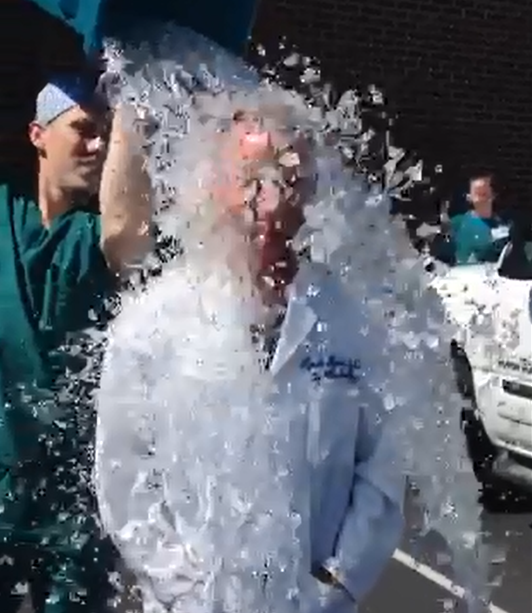 That’s Dr. Monaco performing the ALS Ice Bucket Challenge. He challenged me and I provided him proof that I’d already done it. He also challenged Dr. Hankins and Dr. Ghosh…did they do it? Last week I posted a blog about the ALS Ice Bucket Challenge. The numbers and success of the fundraiser are staggering, to date more than $100 million in donations have been received by the ALS Association and there are 750,000 new donors. The Ice Bucket Challenge has been a huge success and last week I wrote about the fun and novelty of the fundraiser. This week I want to provide more info about the disease. Amyotrophic Lateral Sclerosis, ALS, also called Lou Gehrig’s disease, because it took the life of the legendary New York Yankees first baseman, is a rare disease. About 1 in 55,000 Americans, or 5,600 people, are diagnosed annually with the disorder, a progressive deterioration of the motor neurons that leads to loss of muscle control and movement, and eventually the ability to breath. Death usually occurs about two to 10 years after diagnosis, but it’s not universal. Most individuals get a sporadic from of the disease. The ALS Association estimates the mortality rate at 2 per 100,000 population in the U.S., or about 1,500 people per year. Not much is known about why is strikes people, or even what causes it. Only 5% of patients inherit the disorder. Progress in ALS research has been slow. The last time a drug was approved for treatment of ALS was 1995 and the drug slows progression of the disease for only a few months. ALS is a disease that has no treatment, bad outcomes and no known cause and that’s why the Ice Bucket Challenge has been so successful. Prior to the challenge the ALS Association had raised a total of $99 million for research. The money raised through the challenge this year will help open new avenues for research and hopefully get us closer to better understanding the disease and identifying treatment. The Ice Bucket Challenge has helped the ALS Association create bigger buckets for the organization.